In the process measurement and control field, vortex flowmeters are noted for their ruggedness, versatility, comparatively high accuracy, and absence of moving parts. 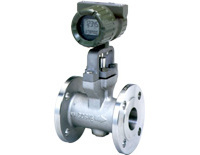 They are compatible with numerous applications requiring measurement of flow in gases, liquids, and steam. The Yokogawa digitalYEWFLO vortex flowmeter is an accurate and stable device, even in harsh process conditions, and has a highly reliable and robust design that can deliver improvements in plant efficiency and reduced operating costs. It is available in several versions, one of which is multivariable, providing a calculated mass flow rate output. When a shedder bar is placed in a flow, Karman vortices are generated on the downstream side of the bar. The Karman vortices are detected by two piezoelectric elements installed in the upper part of the shedder bar. The vortex frequency is proportional to the flow velocity in a specific range of Reynolds numbers. Therefore, flow velocity or flow rate can be determined by measuring vortex frequency. Noise caused by strong piping vibration may affect the accuracy of vortex frequency detection. The two piezoelectric elements in the digital YEWFLO are installed in a configuration that is polarized, so they are not affected by vibration in the flow or vertical directions. The noise of vortex (lift)- direction vibration is reduced by adjusting the outputs of the piezoelectric elements. Combining these features with the Spectral Signal Processing (SSP) function provides optimum and stable measurement. Share your process measurement challenges with a product application specialist. The sharing of ideas and information will produce the best outcome. Yokogawa digital YEWFLOW Vortex Flowmeters from Miller Energy, Inc. The Yokogawa FieldMate family effectively supports the initial setup, daily maintenance, and troubleshooting for the maximum utilization of intelligent field instruments. FieldMate is a flag ship product of the FieldMate family which is a PC based full functional and full field protocol configuration tool. The YHC5150X FieldMate Handheld Communicator is the latest HART® Communicator from Yokogawa. 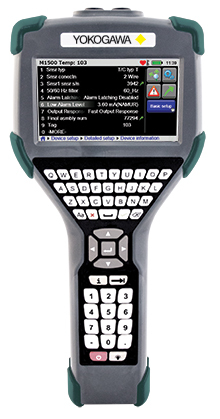 All HART® field devices can be configured, polled, and trimmed utilizing a Windows Embedded CE™ based system for faster processing and greater storage capacity. All options are standard and no subscription is required. The YHC5150X is a full function, DD Direct, HART® Communicator supporting universal, common practice, and device specific commands for commissioning, configuration, and maintenance operations. The video below provides additional detail and an overview of the product in action. More information on the HART Communicator, as well as other innovative products to improve productivity and effectiveness, is available from a product specialist.